I just boarded the Westbound Toronto-Hamilton train. My battery is about to die, but I hope there will be enough juice to finish this post up. Fittingly, I plan to talk about… batteries. While attending the editorial board meeting of OBC last week in London, my wife and I had a chance to spend time with Kyrill, my old friend from elementary school days. Kyrill got his degree in economics back in Moscow and now lives in London. In fact, he literally lives in a building behind Westminster Abbey, which is a superb location. Now… I rarely have meaningful conversations about science with my non-chemistry friends. For instance, they keep asking me: “Hey Andrei, have you invented a new element?” What do you say to something like this? It used to drive me crazy, but I eventually found a way to counteract. In a recent chat with another one of my school buddies, Sergey, I asked him in response: “Have you invented a new octave?” He is a musician, and he got really irritated when I said it. Seriously, though, we do need to find ways to communicate science (or music) to those who do not have technical expertise… I am not great at it and I fully admit it. What’s remarkable is that, once in a while, I hear about some amazing advances in science and technology from unexpected sources. In this case, it is Kyrill. Last week, after one too many Lagavulins, Kyrill asked me about my current interests. Amongst other things (as far as I can recall), I told him something about peptides. This morning Kyrill sends me a link to StoreDot (http://www.store-dot.com). This Israeli start-up, backed by Roman Abramovich (the owner of Chelsey FC), has developed technology that allows one to charge his/her laptop or cell phone in a matter of seconds (http://www.mirror.co.uk/news/technology-science/technology/charge-your-mobile-phone-30-4687363). The most interesting thing is that this nanotechnological advance is enabled by peptides. The prototype is not yet ready for primetime, but it is on its way. All of this goes to show that you really never know what you are going to learn from your non-scientist friends. I now need to investigate the origins of this technology. Plus, it will be interesting to see if the inventors could come to our American Peptide Symposium next Summer. I think that a lot of people will be keen to learn about the role of peptides in batteries. For now, though, I need to be mindful of my train stop, which will hopefully come before my laptop battery dies. The stereoelectronic effect is behind a massive number of molecular properties, one of which is the propensity of certain groups to influence carbonyl reactivity. 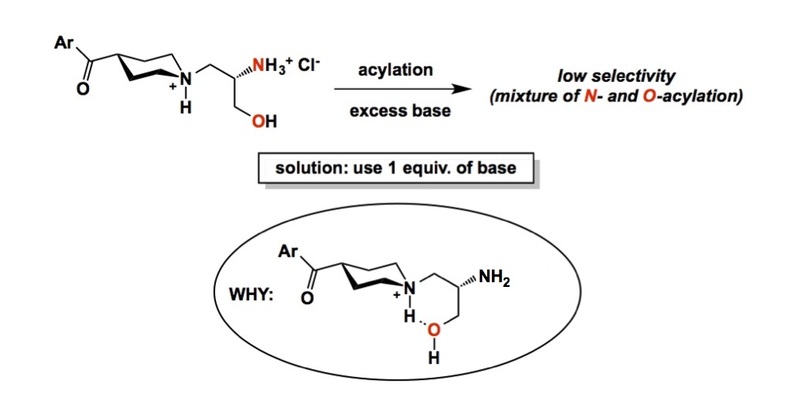 Some time ago, Houk and colleagues clarified the influence of cyclopropyl substituents on the pro-drug properties of esters. 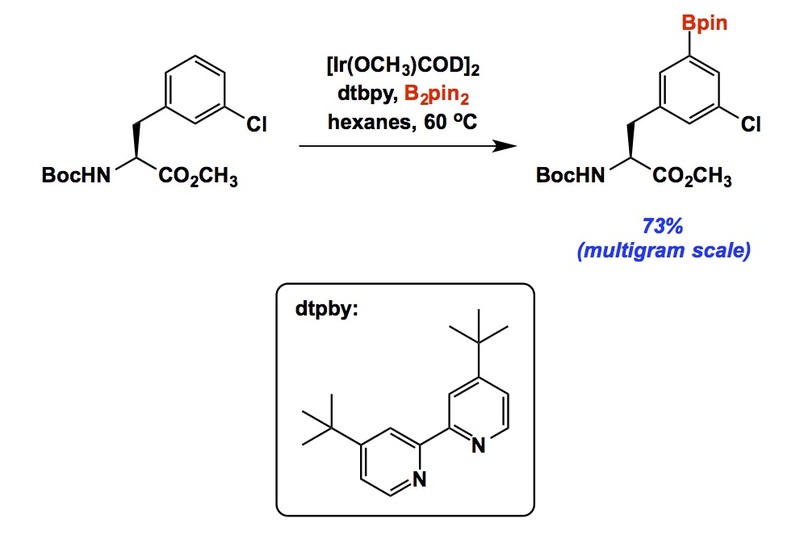 The half-lifes shown below are experimentally determined and speak for themselves: there is a profound effect of the cyclopropyl group on ester stability. But the main reason for my post is to bring up the value of isodesmic equations in evaluating relative reactivity (see Table 3 of the Org. Lett. paper). This straightforward tool is simple and effective in efforts to rationalize the role of neighboring substituents when a HOMO/LUMO interaction is evaluated. In the present case, the 2 kcal/mol stabilization of the cyclopropyl ester compared to the isopropyl one arises from hyperconjugative donation from the cyclopropane group into the pi*(CO) orbital. I think we should use this tool way more in our work (as we assess which molecules should be made and which ones should remain on our whiteboards). 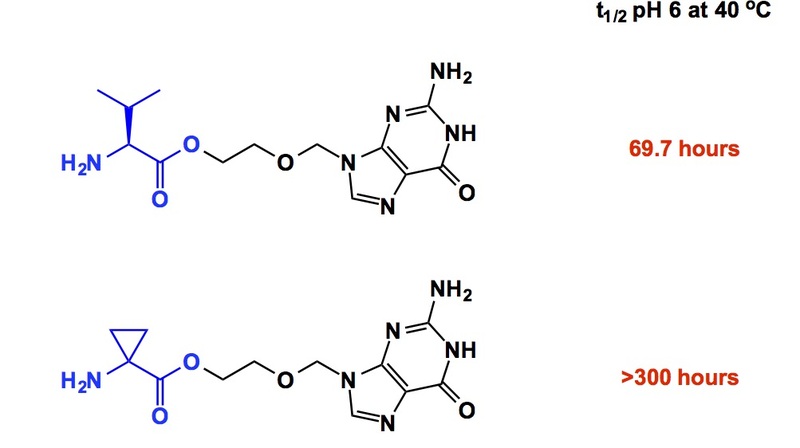 A protein of some significance (shown on the right) is usually our target, but the options we use range from small molecules to substantially larger macrocycles. 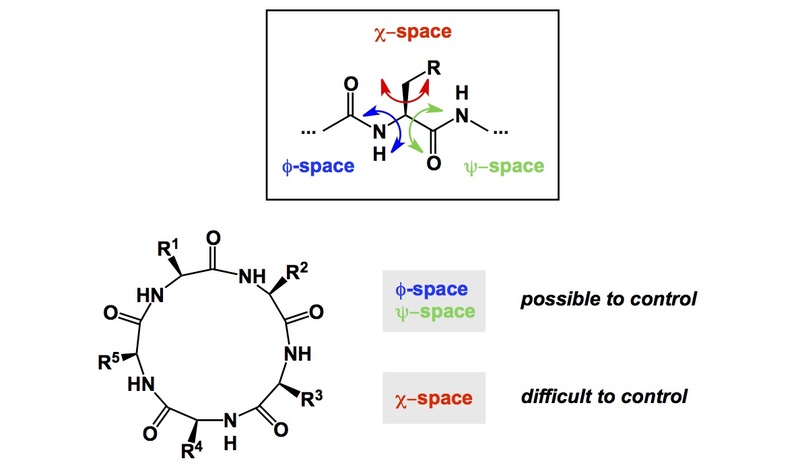 The way I like to put this into perspective is to say that when we interrogate proteins with small molecules, we are drawn to the relative simplicity with which we can modulate enthalpic interactions. 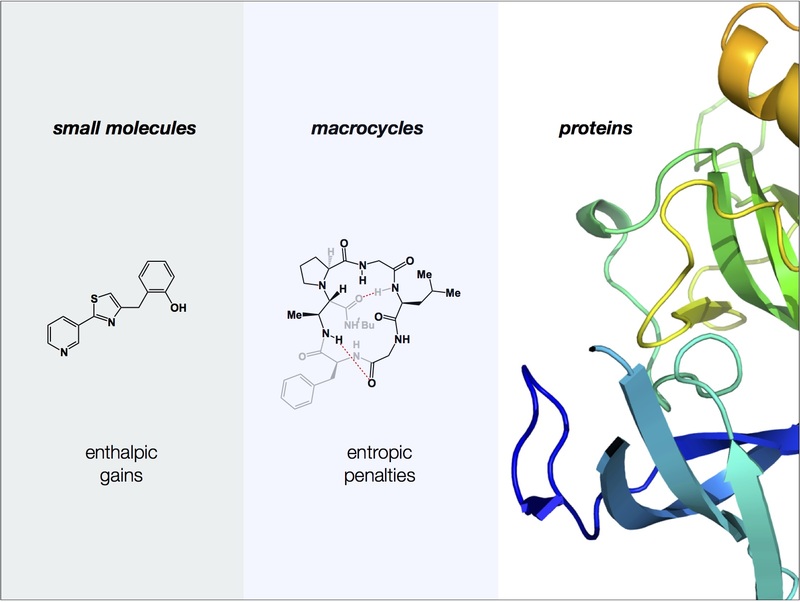 The middle ground in this continuum is occupied by macrocycles, which represent an intuitively clear connection to entropic penalties accrued in a protein/protein interaction. There indeed appears to be a certain entropy-centric “gut reaction” chemists have when they look at a macrocycle. This way of thinking becomes particularly meaningful when there is a need to “freeze” parts of a protein secondary structure. I do think there is a conceptual continuum of sizes. I am also convinced that there is no need to be dogmatic about compartmentalizing oneself into a comfort zone in a narrow part of the spectrum. All options need to be deployed at the right moment. During our visit it was also great to interact with Tomi Sawyer of Merck, who was the head of chemistry at Aileron until not long ago (the stapled peptide company started by Greg Verdine). Tomi will be one of the lecturers at the American Peptide Society Meeting I am putting together with Ved Srivastava of GlaxoSmithKline (http://aps2015.org). I can’t wait to hear about Merck’s latest accomplishments. Thank you, Yusheng, for a day full of insights! Over the past several days I have been in London, England, where I attended the Fall Board Meeting of Organic and Biomolecular Chemistry. Richard Kelly, the Managing Editor of this RSC publication, has put this meeting together in the Mayfair district of London. Jeff Bode (ETH, Zurich) is stepping down as the Board Chairman and I will be taking over his responsibilities from January 2015. I have to tip my hat off to Jeff for his leadership over the past several years. I have thoroughly enjoyed my role of one of the Associate Editors. The difference now will be that I am no longer going to handle manuscripts, but will instead oversee some strategic areas for growth and improvement. I think this will be very exciting. Earlier this week, I had a lot of fun together with Jeff as well as Ashraf Brik of Ben Gurion University, Margaret Brimble of the University of Aukland, Tony Davis of the University of Bristol, Jonathan Clayden of the University of Manchester, Pauline Chiu of the University of Hong Kong, and Paolo Scrimin of the University of Padova. Unfortunately, Jin-Quan Yu of Scripps was not able to make it to this meeting. Along with Margaret and I, Jin-Quan is one of OBC’s Associate Editors. This past Summer I was asked by the Editorial Board of Chemical Science to write a Perspective on macrocycles. At first I was not sure what I would do because there were so many detours I could have taken (from synthesis all the way to applications). No matter how hard I wanted to narrow in on one theme, I ultimately decided to focus on the evolution of this exciting field, using various landmarks to weave my story around. I chose to talk about many different, seemingly unrelated, subjects that bear on macrocycles as a class of molecules with tremendous upside in drug discovery. Overall, this turned into a fun exerience. As they say in Russia “anything new is a well-forgotten past,” which is certainly a good thing to remember when looking at a field of research that is interesting to so many people. One of the attractive things about a perspective is that its author is not expected to be comprehensive. The choice of material is up to you. Deciding on interesting examples is what I did on my train rides from home to work over the past several months as I was writing this paper. You will note that I am the only author. I suppose this is something that is much easier to do nowadays with software such as Papers3 that allows one to nicely organize manuscripts. I also think that it is also appropriate to write papers without graduate students or postdocs once in a while, especially when it comes to opinionated pieces. Actually, I think that perspectives should ideally be written by one person, otherwise the whole point is not entirely clear. I love writing papers with my students, but I also found this solo business to be satisfying. As a prelude to this work, I would offer this: it is really tough to control the so-called chi-space, the one that defines conformational movement of side chains. There is a big irony in overemphasizing the significance of new ways to form macrocyclic ring structures: these studies offer constraints over phi and psi dihedral angles, but they provide little towards control of chi-space, which defines the orientation of side chains. Many of the problems I have outlined in my article can be fixed if synthetic chemists think more about how to modify the existing rings, understand their conformational preferences, and control side chains in effort to make bioactive structures for protein targets.